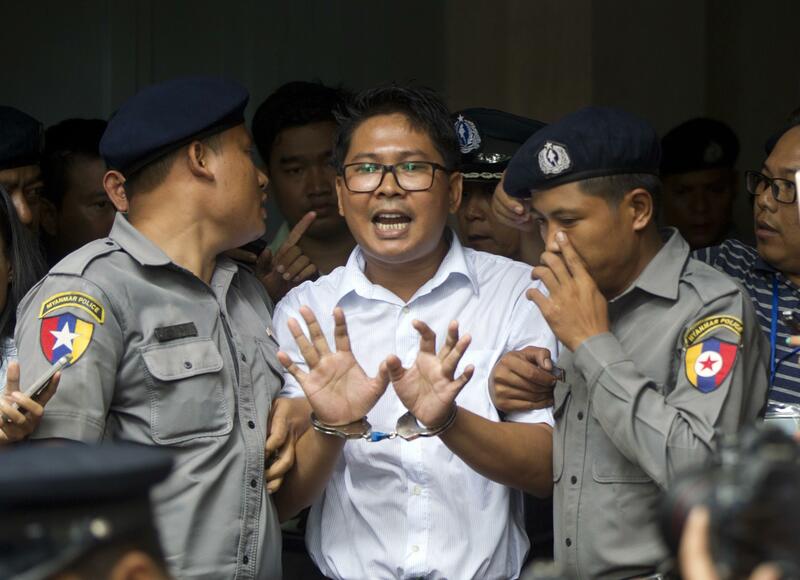 Sun., Sept. 2, 2018, 9:42 p.m.
YANGON, Myanmar – A Myanmar court sentenced two Reuters journalists to seven years in prison Monday for illegal possession of official documents, a ruling that comes as international criticism mounts over the military’s alleged human rights abuses against Rohingya Muslims. Wa Lone and Kyaw Soe Oo had pleaded not guilty to violating the colonial-era Official Secrets Act, punishable by up to 14 years in prison. They contended they were framed by police. The verdict was postponed from a week ago because the presiding judge was ill. The case has drawn worldwide attention as an example of how press freedom is suffering under the government of Nobel Peace laureate Aung San Suu Kyi. Her taking power in 2016 had raised hopes for an accelerated transition to full democracy from military rule, but she has since disappointed many former admirers. Wa Lone, 32, and Kyaw Soe Oo, 28, both testified they suffered from harsh treatment during their initial interrogations. Their several appeals for release on bail were rejected. Wa Lone’s wife, Pan Ei Mon, gave birth to the couple’s first child in Yangon on Aug. 10, but Wa Lone has not yet seen his daughter. In the latest U.S. expression of concern, Washington’s envoy to the United Nations, Nikki Haley, said the Trump administration expected to see the two journalists acquitted of all charges. Published: Sept. 2, 2018, 9:42 p.m.